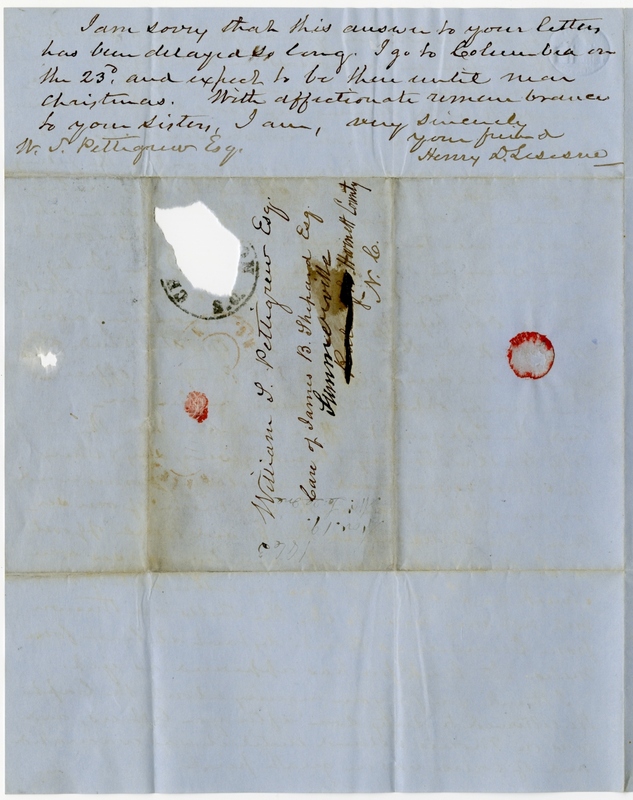 Item description: Letter, dated 19 November 1863, from Henry Deas Lesesne to William S. Pettigrew. 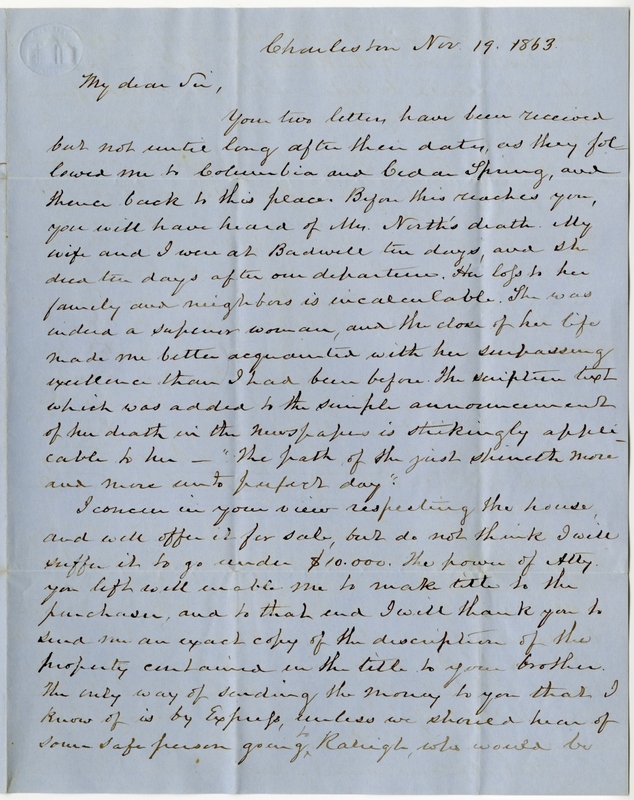 In this letter, Henry describes the death of a relative, Mrs. North, and arrangements to care financially for the son of Pettigrew’s deceased brother. Lesesne also describes military action around Charleston, including shelling that damages City Hall. 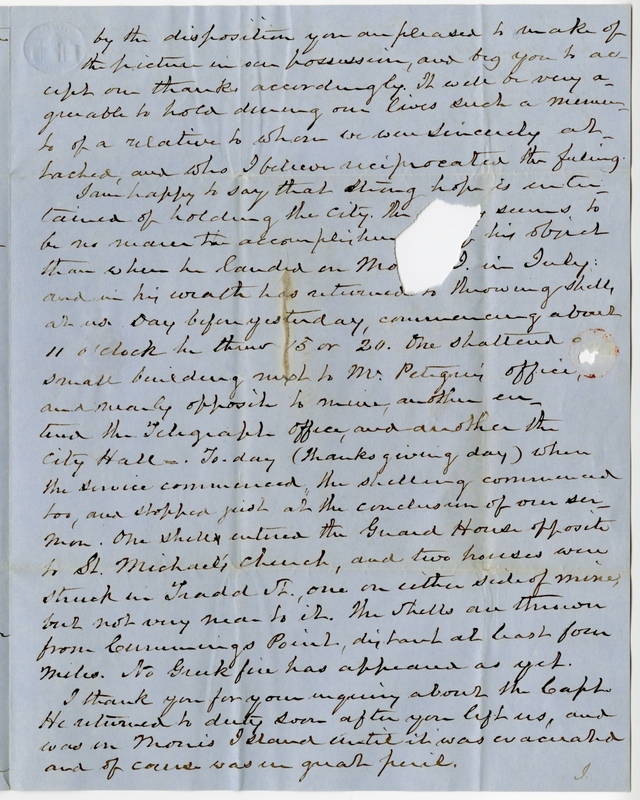 Item Citation: From folder 266 of the Pettigrew Family Papers, Southern Historical Collection, Wilson Library, University of North Carolina at Chapel Hill. I concur in your view respecting the house and will offer it for sale, but do not think I will suffer it to go under $10,000. The power of Atty. you left will enable me to make title to the purchaser, and to that end I will thank you to send me an exact copy of the description of the property contained in the title to your brother. The only way of sending the money to you that I know of is by Express, unless we should hear of some safe person going to Raleigh, who would be willing to carry it. I could send you a certificate of deposit in one of the Banks at Columbia, where it would be safe until you could find some opportunity of getting it transferred to N. Carolina. While at Cedar Spring I made up an account of the fund which your brother held in trust for your nephew Thomas. It consists of 8 shares in the So. Ca. R. R. Co., three in the Planters & Mechanics Bank, one in the Bank of South Carolina, and a deposit of $152 in the Charleston Savings Bank, besides a cash balance of $236.12. Your brother invested the income regularly until he went to Virginia in 1861, and the above cash balance is made up of dividends collected by me since that time. I will invest it in Gen. S. stock, if I do not hear from you to the contrary: indeed I do not know of any other investment I could make. As to the stocks belonging to the estate, the city stock and Greenville R. R. bonds could be sold far above par, the Spartanburg & Union R. R. bonds a little above par and the North E. R. R. company’s bonds above cash. I do not know what could be obtained for the [?] central R. R. bonds. They would not probably be very saleable: but the heavy interest of 10 per cent had always been regularly paid by the agents here. My wife and myself are very much gratified by the disposition you are pleased to make of the picture in our possession, and beg you to ac-cept our thanks accordingly. It will be very a-greeable to hold during our live such a memen-to of a relative to whom we were sincerely at-tached, and who I believe reciprocated the feeling. I am happy to say that strong hope is enter-tained of holding the city. The [?] seems to be no nearer to accomplishm[ent of] his object than when he landed on Mo[rris] I. in July: and in his wrath has returned to throwing shells at us. Day before yesterday, commencing about 11 o’clock he threw 15 or 20. One shattered a small building next to Mr. Pettigrew’s office and nearly opposite to mine, another en-tered the Telegraph office and another the City Hall. To-day (Thanksgiving day) when the service commenced the shelling commenced too, and stopped just at the conclusion of our sermon. One shell entered the Guard House opposite to St. Michael’s church, and two houses were struck in Tradd St., one on either side of mine, but not very near to it. The shells are thrown from Cummings Point, distant at least four miles. No Greek fire has appeared as yet. 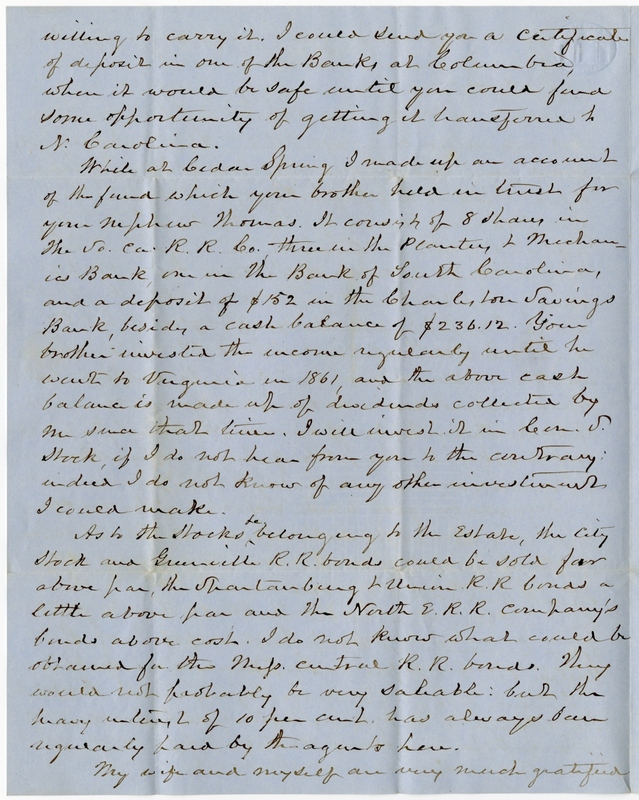 This entry was posted in Southern Historical Collection and tagged banks, bonds, Charleston (S.C.), death, grief, Henry Lesesne, railroads, real estate, shelling, stocks, William Pettigrew. Bookmark the permalink.